Australia and New Zealand are concerned about Chinese military expansion–and they should be! Her comments came after reports China has approached Vanuatu about building a permanent military presence in the South Pacific. While no formal proposals have been put to Vanuatu’s government, there have been discussions between China and the island nation, and senior security officials believe Beijing’s plans could culminate in a full military base. onga had also been mentioned in government circles as a possible site for a Chinese base, though recent discussion had centred around the intense efforts China had put into Vanuatu. Defence experts said a military base on Vanuatu, which would likely be followed by bases elsewhere, would allow the Chinese People’s Liberation Army to challenge the US’ post-war dominance of the Pacific, which is strongly supported by Australia and New Zealand. China reportedly accounts for nearly half of Vanuatu’s $463 million foreign debt. HONG KONG/BEIJING (Reuters) – The islands of Vanuatu may appear as relative specks in the South Pacific Ocean, but for China’s military strategists, they could provide a significant boost in Beijing’s ability to project naval power. In 2016, we made a video titled: Are Chinese threats against Australia for real? China has harsh words for Canberra’s response to the recent South China Sea ruling. Around the announcement of the arbitration tribunal over the South China Sea, Australia was one of the most delirious countries. Canberra immediately supported the arbitration result and claimed China “must” abide by it, and also signed a joint declaration with the US and Japan. Australia has inked a free trade agreement with China, its biggest trading partner, which makes its move of disturbing the South China Sea waters surprising to many. So, China is indicating that Australia is basically illegitimate (established through uncivilized means) and that its power basically means nothing to China. Furthermore, China must take revenge and let it know it’s wrong. Well, If Australia steps into the South China Sea waters, it will be an ideal target for China to warn and strike. A high-tech Chinese spy ship has been spotted off the Queensland coast monitoring joint military exercises between Australia and the United States, in what Defence officials have described as an “unfriendly” and “provocative” act. The ABC can reveal the Auxiliary General Intelligence (AGI) vessel from the People’s Liberation Army was sighted by the Defence Force in international waters during this month’s Talisman Sabre war games. 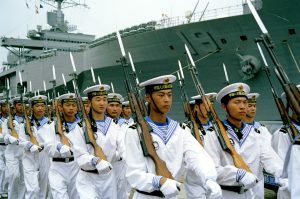 The Type 815 Dongdiao-class AGI vessel is fitted with advanced communications systems designed to eavesdrop on other militaries. In a statement to the ABC, Defence confirmed the spy ship had “been operating off the north-east coast of Australia” during the joint military exercises. “The Chinese vessel has remained outside Australian territorial waters but inside the Australian Exclusive Economic Zone in the Coral Sea,” the department said. “Exercise Talisman Sabre is currently taking place in the vicinity. The vessel’s presence has not detracted from the exercise objectives,” it added. Should Australia and New Zealand consider that China has ambitions to control it? The actions by China should serve as a wake-up call, but so far, Australia and New Zealand have not taken steps to truly turn to God. If they think that the USA will be able to stop this forever, they are mistaken. The USA itself will also be taken over one day per Daniel 11:39 (see also USA in Prophecy: The Strongest Fortresses). This entry was posted on Tuesday, April 10th, 2018 at 2:00 pm	and is filed under Prophecy. Australia concerned about Chinese espionage warship–and they should be!